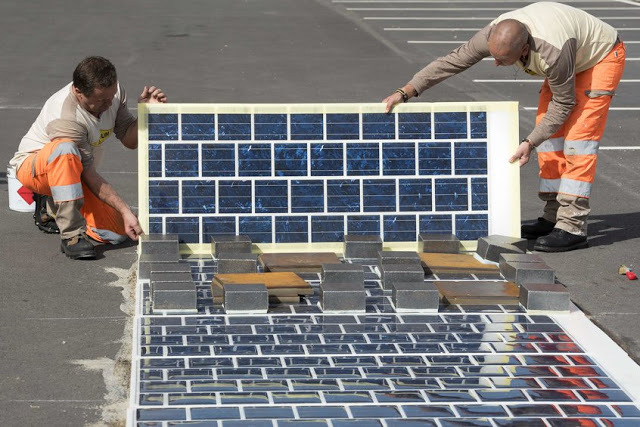 France has opened the world’s first solar panel road. The road which is 1 km (0.6 miles) long was inaugurated in the small village of Tourouvre-au-Perche by France's ecology minister, Ségolène Royal on Thursday. 2,000 motorists will use the road in a day for a two-year test period. The test will determine whether it generates enough energy to power street lighting in the village of 3,400 residents, the guardian reported. The photovoltaic solar panels called "Wattway" which will be used in the project is jointly developed by the French infrastructure firm "Colas" and the National Institute for Solar Energy. The specialty of "Wattway" is that it's very sturdy and can let heavy trucks pass through it, also offering a good grip to avoid an accident. Interestingly, this project will not remove road surfaces but instead, the solar panels will be glued to the existing pavement. Such solar road project is not new, a couple from Idaho have already crowdfunded a similar prototype in 2014. The couple has managed to raise a total of $2,266,052USD for their project in a crowdfunded Indiegogo campaign. Adding that, they were granted a 2-year $750,000 contract by the Federal Highway Administration in December 2015. In 2015, the dutch opened the first solar road that converts sunlight into electricity. Though the electricity generating road is only 100 meters long.